R&D spend is 23% of revenue. 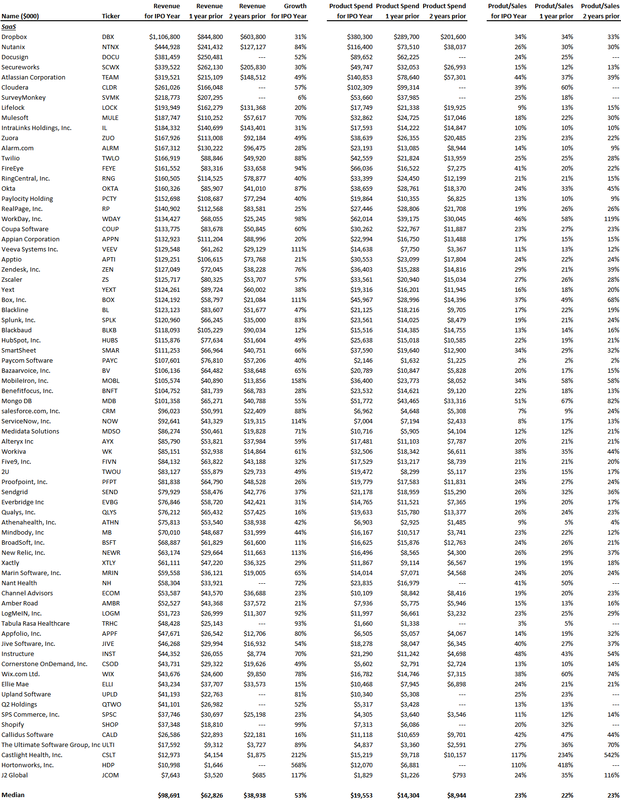 Leading up to the IPO, SaaS companies spent on median 23% of revenue on R&D. As you can see there is almost no deviation between the financials reported at IPO and 2 years prior. (medians were 22% and 23% respectively) For many of these companies, they were in their Series B or Series C two years prior to IPO, so it’s safe to say that spending a quarter of revenue on R&D is the right level for a SaaS business even at earlier stages. No matter where your SaaS business is in its lifecycle, as one founder put it to me, “managing a large and growing stack for a cloud application is damn tough” so you’re going to be spending materially on the stack no matter how fast you’re growing or how mature you are. Median spend is $20mm. The median level of revenue at IPO for these SaaS businesses was $99mm so with 23% of revenue going to R&D, that means R&D spend was $20mm on median at the time of IPO. That’s a lot of dev talent. The range of spend is wide. Hortonworks and Castlight spent more on R&D than they generated in revenue, with R&D/revenue of 110% and 117% respectively. On the other end, Paycom software spent only 2% of revenue on R&D, and that business did $108mm in revenue prior to IPO. Similarly, Tabula Rasa spent only 2% of revenue on R&D. Smaller businesses spend more. Not surprisingly, given the fixed cost nature of R&D, the 10 smallest companies by revenue spent 41% of revenue on R&D while the 10 largest spent 24%, closer to the overall median. Smaller businesses are likely going to have to expend a larger percent of revenue on R&D than their more mature peers. Note that those smaller businesses are faster growing, with average revenue growth of 127% for the 10 smallest on the list versus 47% for the 10 largest.